Having been at the hands of blight two years running which has severely effected the harvest. Large sized plum tomatoes have deep red skin and a rich dense flesh ideal for pasting. As the name suggests, this is plum or paste tomato. Originally from Wisconsin, USA this is one of the largest fruiting plum tomatoes that we know - and not only are the fruits large but Amish Paster reliably produces a heavy crop of them! 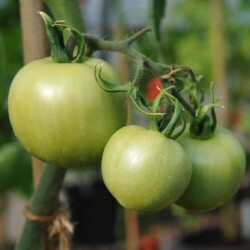 The fruits are virtually core-less and have a really rich and sweet tomato flavour - making them perfect for eating in salad or for making sauces and passata. But where this variety really comes into its own is just how well the Autumn picked green fruits store, and can be later brought into warmer conditions to ripen - giving the potential to be eating 'fresh' home grown tomatoes as late as February. To make the most of this varieties long keeping we would advise a second sowing around May / June to ensure a large quantity of green fruits hanging on the vine in October. These should be picked complete with calyx (the little green 'spider') and wrapped dry in soft tissue and stored at around 50ºF (10°C). Throughout December, January and February transfer the green fruits to a fruit bowl as required, take off the tissue and place a ripe banana; at normal room temperature of around or apple amongst a few of the green tomatoes. 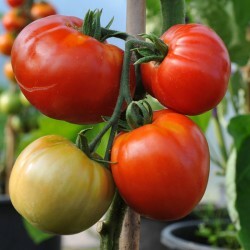 In a temperature of 70°f - 75°F (21º - 24ºC) will ripen over a period of about two weeks and have the taste of summer tomatoes. Large smooth fruits have crimson skin and really sweet flavour. A good variety for picking green and storing for ripening later. Originating from the Himalaya Mountians, this variety produced masses of large fruit - not quite a beefsteak but larger than a 'regular' tomato. The smooth skinned fruits rarely crack and are consistently well rounded. The flesh within is extremely sweet and juicy making it perfect for just about anything! One real bonus of 'Nepal' is its keeping qualities. Pick the fruits green and store individually wrapped in tissue just as you would apples - and then bring into warmer conditions to ripen as you require; this way you can have fresh home grown tomatoes right up to Christmas and beyond. Arguably the most blight resistant variety of tomato currently available. 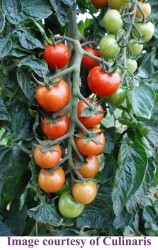 Sweet juicy cherry tomatoes hang in bunches like grapes. Bred in Germany, this new cherry tomato has possibly the highest resistance to tomato blight (Phytophthora infestans) of any variety and is very well suited to outdoor growing where it will thrive - and interestingly the fruit has a better flavour if grown outside than in! We first trialled this variety in 2013 and found it to be extremely strong growing - out performing all our other outdoor tomatoes with the exception of its cousins from the same breeding program - 'Clou' and 'Primavera'. What are you growing this year and more importantly why have you chosen them. That plum tomato looks good. As we're moving, for the first time for years I have not bought seeds. I shall rely on a garden centre near to where we're moving in Suffolk for plants. Feels really strange not sowing seeds. Sungold because they are still the sweetest tomato I've tasted. Roma (new to me) for cooking and preserving. Outdoor Girl - old fashioned but I used to grow this and is very prolific. Pear drops - a small yellow pear shaped tomato mainly for its looks. We get blight every year on the allotment (in the SE of UK) because there are so many people growing tomatoes in a small area & the weather always seems to turn wet in early summer these days (even those with greenhouses get blight here). The only way round this for us is to grow blight resistant varieties which help but are not totally immune to blight & tend not to be the best flavoured; or to grow the outdoor varieties designed to ripen very early before the worst of the blight takes hold - in a reasonably sunny year these produce ripe, relatively tasty fruit outdoors from early June. Sadly the really tasty heritage varieties always fall victim to terminal blight. Great post Dawn. Love the look of the Nepal ones. I have thought fairly carefully about my tomatoes this year. I wanted cherry and beek ones but I also wanted some specially for bottling so REALLY hope they come out well. Do you find Cordon varieties are easier, better to grow? I have had a quick look a the woodash article. Would you be using the ash from your Rayburn as I could do? Ash from the log burner as it we use wood only on that, the rayburn tends to get other things thrown on it as well as wood, I grow cordons rather than bush because they seem to take up less space as they grow up easier to tie in as well. We're sowing Brandywine beef steak which was one of the first tomatoes I wanted to grow after HFW suggesting them somewhere once. It was the one that got me hooked. Sungold as last years crop was amazing. Tigerella as they look different and I'm open to persuasion. Also a selection (2 of each) of other varieties which are my testers to see if I like them, that have been suggested by people over the years. Now I didn't know you could get tomatoes that store like the above, so I may look myself and add some of these for the later sowing as suggested on the Longkeeper then save their seed for the year after. We grew Amish Paste for the first time last year. They were late coming on but great tomatoes! 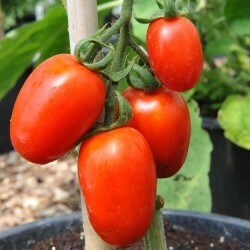 Thanks for the link about wood ash, definitely try that.I grow Amish paste, San Marzano for sauce,Gardeners Ecstasy,Chadwick cherry for cherry types,Aurora, skyumish,rose de Berne,Dr Carolyne Pink, Grushovka,Brandy wine for both eating and cooking (Many of these from Realseeds ,here in Wales also Maskotka for very early tomatoes I am trying some others also this year. If the flavour isn't really good, I dont grow them a 2nd year. I seem to have less trouble with these on blight, but grow mainly in the polytunnel. I would also recommend Lipstick peppers from Realseed.flavout is excellent and I have just picked the last today, still firm and juicy.The plants are still green stemmed and showing signs of new shoots. I have spare seeds of the giant Achoca, which gro to about large pepper size and can be stuffed.